Church of England services have been conducted in South Africa since the late eighteenth century. However, when in 1833 an Anglo-Catholic Bishop was appointed to lead the Church, there were those who preferred to follow the Reformation principles and teachings of the Church of England. Thus, when in 1870 Bishop Gray formed the Church of the Province of SA, these evangelical churchmen remained outside the new body. On the advice of, and with the assistance of Archbishop Mowll of Sydney, those evangelicals who wished to remain true to their heritage adopted a Constitution in 1938. This Constitution enshrines the Reformed, Protestant and Evangelical faith handed down by our forefathers. Today, with our own Bishops, the Church of England in Southern Africa is making an increasing impact on the spiritual life of this part of Africa. We have congregations amongst all sections of the community. In addition, we are involved in worldwide missions and social projects such as care for AIDS patients, education and poverty relief. Together with other groups of similar persuasion, we are endeavouring to present the evangelical voice in Southern Africa. As CESA enters the twenty-first century it reflects both continuity and discontinuity with the church that had its origins in the Cape Colony two hundred years ago. Theologically we identify totally with the protestant, evangelical and reformed heritage of that day. We hold to the same insistence on the inspiration and final authority of Scripture, the fallenness and helplessness of sinful man, the sufficiency of the finished work of the God-Man, Jesus Christ our Lord, the necessity for new birth through the power of the Holy Spirit, justification by the imputed righteousness of Christ received by faith alone, and the necessity for holiness as the only adequate evidence of the new life. Liturgically, we have sought to retain the reverent spirit of the reformers of old, without slavishly following the traditional letter. As to our mission, we are aggressive but not superficial in evangelism, and have, after a period of being part of the evangelical retreat, recognised our responsibility to be salt and light in all aspects of society. Our theological college is seeking to rise to the intellectual and social challenges of the new South Africa and the new Western world, but without compromising the unchanging message of salvation through Christ alone, or accommodating it to modern whims and fancies. CESA see its mandate as reaching the people of South Africa with the good news of Jesus Christ. 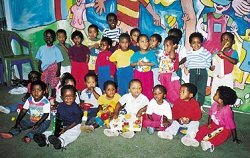 From a small and scattered group of Christian in 1938 we now have congregations among all the different ethnic groups of South Africa. Our work stretches into Namibia, Malawi and Zimbabwe. Mission teams regularly visit Mozambique. In addition to the task of evangelism and church growth, we have established eleven schools and pre-schools throughout the counrty. A community centre has been established in the huge township of Khayelitsh outside Cape Town. A remarkable ministry of compassion has developed in Kwa-Zulu/Natal where Kees and Anita Keyser have established an AIDS centre for babies with HIV. This centre is called “Lily of the Valley” and provides not only care for the dying but education for parents as well. To visit this centre is to be deeply challenged. We are commited to planting new churches in different communities as regularly as possible. There ar groups throughout the country and further north who would like to affiliate with us, but at present we cannot provide either the personnel or the finances to accommodate all the additional responsibility.